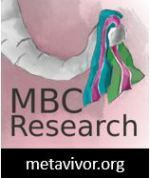 After being diagnosed with breast cancer, I participated in a medical study about “finding meaning.” One of the concerns is that there is a high instance of depression among cancer patients. Psychologists at Sloan wanted to learn more about ways patients were able to cope with cancer through finding meaning or creating meaning in their lives — creating reasons to want to exist. There were several 2-hour sessions where each patient was asked multiple questions. One of the questions was, “what gives your life meaning and how does it help you cope with your illness?” The answer came naturally to me; I said “my pets,” and among them was Layla. Layla gave me reasons to want to exist. I am not saying my pets were the only reasons, but they were a very important one. I am not going to go into details about the difficulties I’ve faced in my life or my lack of support. Honestly, that topic deserves a blog of its own. What I want to talk about is how my sweet Layla helped fill that empty space in my heart and in my life. Layla was the last of my three guinea pigs. She outlived the others by over a year. What makes losing Layla so difficult for me is that she was always there for me no matter how dark my world seemed to be at times. She was a representation of home in my life. She never made me feel like I was alone. Layla was my confidant and made me feel like I had a family. I even saw her as my baby. Layla passed on June 18th at 6:37 AM in my arms at home. It was very difficult to see even when her vet told me there was no treatment for her condition (musculoskeletal degenerative disease due to her old age). Can we really prepare ourselves for losing someone special to us even when we know there isn’t much time left? I know I can’t. I have celebrated Thanksgiving and Christmas with my pets — just us. I remember one holiday I prepared a plate of different veggies for Layla and sat her next to me while I was having my dinner, alone. I had my pet companions and felt loved. That year, I mostly celebrated having them around. I felt grateful I wasn’t completely alone. It didn’t matter what I was facing in my life, I always knew Layla was there to remind me that there were reasons to smile and to keep going. Her gentle and undemanding character allowed me to give in and just be myself, a risk I am often skeptical of taking with people. You know how sometimes we’re too careful to love because we fear getting hurt or being rejected? I never felt this way with Layla or any of my other pets. What you saw is what you got with Layla. There was no agenda and her love was unconditional. 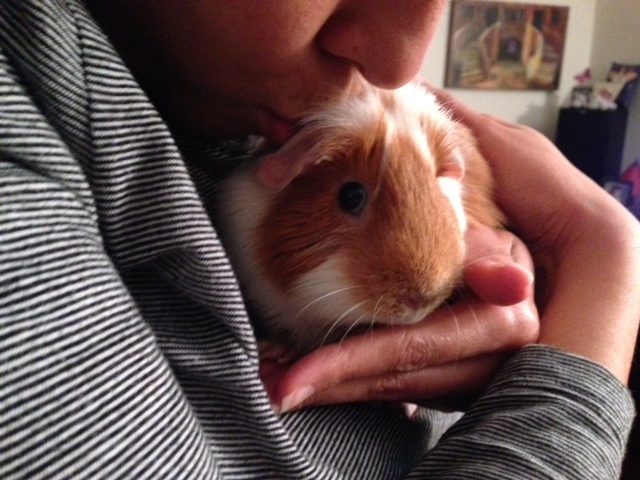 Yes, guinea pigs do love. Layla actually liked to cuddle with me and often fell asleep in my arms, especially after she got older. Layla was not my only support but was part of my home. I can’t remove her cage or any of her belongings from my room. It is hard for me because in a way I want to continue to imagine she is still here. I was lucky she lived with me for this long, but at the same time, the long time I spent with her makes my grief more difficult because I got so used to having her around. Is there a perfect way to grieve? It is difficult for me. I understand nothing is eternal in life. I tried hard to extend Layla’s life as long as nature would allow me to with the help of her vets at the Center for Avian and Exotic Medicine (Dr. Pilny being her primary vet). That’s what I need to keep reminding myself. I tried preparing myself for her death because I knew she didn’t have that much longer. Guinea pigs rarely make it to 8 years and Layla exceeded those years. I continue to tell myself this is it for me. I cannot have more pets (I still have my cat Nelly). It hurts too much to lose them. This is the burden I have to deal with as a loving pet mom. But even though it hurts, I realize I wouldn’t change a thing! I would rather have loved Layla and suffer through her loss than not to have loved her at all. This is the price I have to pay for loving her so much. When I commit to an animal I invest everything in them, including my heart because they are so worth the investment. There are still reasons for me to smile. My memories with Layla will always remain. These memories are proof that it is possible to feel happy and hold on to love when so many other things are missing and when life seems so dark sometimes. Layla was one of my lights during my difficulties. I want to thank Layla for all the time and love she gave me. She was a very special and pure piggy. I loved her to pieces. I hope to see you at the Rainbow Bridge, Layla. Meanwhile, eat all the fruit and veggies you desire. This entry was posted in Family, Support and tagged loss, Love, Pets. Bookmark the permalink. I know that pain. Peace and love to you! And RIP Layla! very sorry to hear that Layla passed away; I am sure you will continue to feel her love and the strength and meaning you found in your interactions with her. Your choice of song for Layla is great, too. Best wishes. I have so many memories of her. I will treasure her memory. Thank you. So so sorry. As a pet sitter, I get this kind of bad news from clients too often. It is heartbreaking. That’s sweet of you to do that kind of job. I would love to work with animals in some way. It is a huge hit to lose a pet, wish they lived longer. Thank you for your words. Thank you Allie. She was very special to me. I am very sorry to hear that your sweet Layla is gone. But not the memories you have of course. As you know, my pets mean a great deal to me too. In fact right now our golden is not feeling well and I am worried since she is 12. I love the part where you shared that you spent the holidays with your pets, just your pets, and that made you feel not alone. That’s the best part of having and loving a pet I think. With them around we are never alone and we can just be who we are, flaws and all. Thanks for sharing about Layla, your special little ‘light’. Nancy, I know how much you love your pets. How could we not? They are too easy to love. I am always able to by myself with my animals and I love this level of freedom which I usually don’t get with people. I hope Elsie is OK. Please do keep us posted about how she is doing. I will say a special prayer for her tonight.